Questions are swishing and dishing, rocking and rolling with some curious eyebrows raised on Peter Biancamano's campaign report. According to the Peter Biancamano campaign's latest ELEC filing, the second ward Hoboken council candidate accepted a strange $2,500 loan from the NJ Institute of Balance in Elizabeth, NJ. A look into that physical therapy business shows its owned by a Hoboken based therapist: Councilman Michael Russo. MSV contacted the Peter Biancamano campaign asking why it's accepted a $2,500 loan not only from a Hoboken slate mate but via his personal business? A voicemail was left for Councilman Michael Russo similarly this morning inquiring why monies are being routed through his personal medical business to Peter Biancamano. Oddly, Michael Russo took on a bigger expense last month with the birth of a baby boy. Councilman Michael Russo is back in the news with an odd 'loan' appearing for $2,500 on the campaign report of Peter Biancamano. The oddly timed loan arrives in the same month as a baby boy for Russo. There's no comment from either Peter Biancamano's campaign or Michael Russo. Set the spin cycle to "launder." Congratulations Mikie! Talking Ed Note: As expected, MSV traffic is seeing a strong ascent adding to the thousands of regular readers all of last week as the City Council election is in full swing. Creating awareness of the election is an important role anyone can do. If you don't have a campaign sign up for your ward, please consider doing so. On the Reform side, you can contact Christian Duffy via email @ duffy.christian12@gmail.com or mobile: (732) 221-8532. Social media is an important venue for heightening election awareness and getting citizens engaged. Use Twitter to retweet or the share buttons below MSV as but one example. On twitter make sure to add #Hoboken into your tweet. Facebook is a great way to share information and engage Hoboken voters. Similarly, there's share buttons here below each story but if you see a candidate's post on Facebook take a second to SHARE IT! Liking a post is nice but sharing is how information get amplified. Just do it now through Election Day. 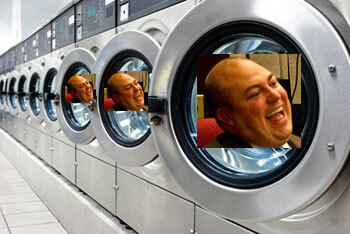 Mikie Russo Laugh & Launder graphic courtesy of Jhnny "to the butter" Newman.